This vast 162 metre yacht was originally commissioned by Prince Jefri of Brunei with exterior styling and interior design by Andrew Winch. The project was suspended in 1998 with just the bare hull and partially complete superstructure. It was eventually sold to the Dubai government, and responsibility passed to Kostis Antonopoulos of Platinum Yachts, which prepared a new in-house interior design. 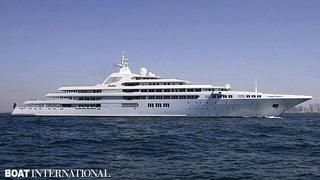 Now complete, Dubai is the royal yacht of Sheik Mohammed bin Rashid al-Maktoum of Dubai. The accommodation is designed for 24 guests and comprises an owner’s suite, five VIP suites and six guest suites, all with open balconies. One special feature is the 21.3m-wide atrium. Other facilities include a swimming pool, barbecue area, cinema, disco, a landing platform for a Blackhawk helicopter, a gymnasium, a garage for the yacht’s submarine and a vast array of water toys. Full certification was obtained from Lloyd's Register of Shipping in October 2006 and she has since made several voyages.